This is where a show begins. Pictures lined up along the wall. A ladder. Some wires. A few people with a good eye. In no time at all groupings come together, taking shape on the wall. Individual items are shifted and realigned for balance until a flow is established and the presentation feels right. This image captures the bright expectation, hope and anxiety of hanging my first art exhibit at the Second Story Gallery, at the beginning of a brand new year. I want to thank all of you who helped to make it happen. Without your help and your encouragement, your experience and your vision I could never have done this. Thank you to the Second Story Gallery Board of Governors and to all of you who came to see the exhibit. It has been a joy to meet you and work with you. Thank you for your interest in my work and for all of the wonderful feedback. This exhibit has been a great way to begin 2008! This image was captured on a sidestreet in Nagasaki, Japan, close to Sofuku-ji Temple. 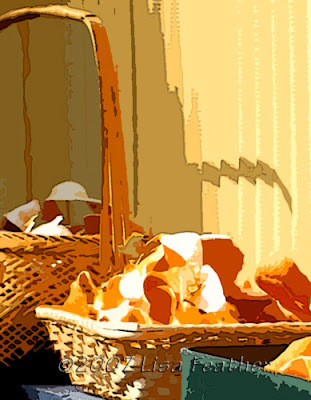 On a grey concrete wall, beside a driveway, someone had set out boxes and baskets of orange peels to dry in the sun. The bright color of the orange peel was such a contrast to the dreary colors around it that we couldn't help but notice, and noticing we saw how beautiful it was. Up close the color and texture of the image is astounding. I tried to bring out the contrast and the feeling of sunshine that this surprising little still life inspired in my mind and heart that day. 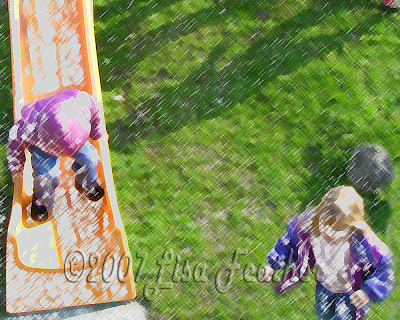 This image of children playing on a playground was captured in Switzerland on a beautiful spring morning. The sun shone brightly and highlighted the fresh newness of the grass and the wonderful colors of the playground equipment and the children's clothing. The enhancements made accentuate the bright colors and gives the image a wonderful childlike quality. 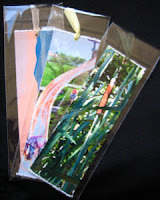 This image is a companion piece to "The Playground." 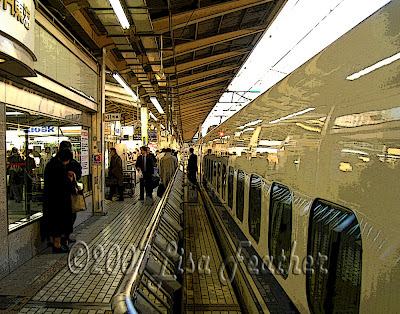 This image of a train platform in Japan suggests the hectic pace of activity there. Kiosks are open, selling food, drinks and magazines. Commuters are hurrying to their trains. Some people are waiting while others are in conversation. Trains are pulling in and out of the station. The platform stretches out as a stage for this activity. Here, the train itself, captures the reflection of the platform and its narrative as it stops to pick up passengers and hurry them to their various destinations. This image was captured somewhere near Mt. St. Helens. 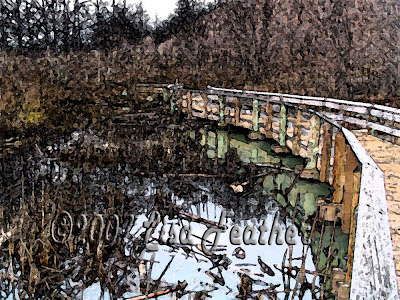 A footbridge frames the edge of a wetland. In the foreground the water shines with a lovely quality of light, reflecting the bridge and the grasses in the surrounding scene. In the distance, the walkway takes us into the darker brush beyond. So many paths in life are like this one,taking us from the brightly lit places that are known to us into the vague unknown, beyond what we can see from where we presently stand. And yet the mystery and the promise of even more breathtaking vistas of God's creation beckons the adventurer in us ever farther down the path and to the other side. 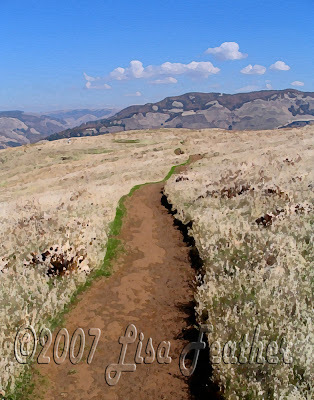 This trail near the Rowena Crest Viewpoint along the Historic Columbia River Highway is easy to hike. It is rather even, with little change in elevation. It offers some gorgeous views and in the spring I understand there are wildflowers to be seen. In the autumn it may seem a bit bland, winding through the dry grass, but if you look more carefully you might see cattails, interesting fall foliage, a tiny green frog, and some beautiful views of the Columbia River Gorge. Still, one of the best features is the trail itself. In a certain even serenity it leads you through what seems like a large plain field though it is high on the Rowena Plateau. Like approaching the Grand Canyon, the landscape is deceptively simple until you reach the rim of the Columbia River Gorge and realize how closely you have been traveling to the overwhelming wonder and beauty of this place. This image captures the simplicity of the trail, the clear color of the sky and a few hints of the wonder and beauty of the view that this narrow path quietly leads you to. Cherry blossoms lend their ephemeral beauty to almost every scene during April in Japan. 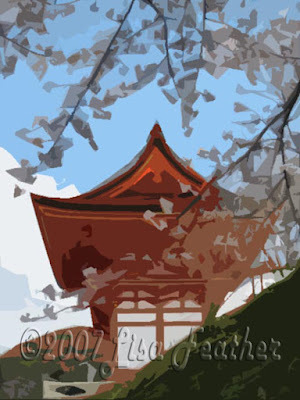 This image was captured at Kiyomizu-dera in Kyoto. The delicate cherry blossoms frame the traditional red outiline of a shrine in the Higashiyama hills as they arch against a beautiful blue sky. The fragile nature of the blossoms and the bright playful color of the spring sky complement and enhance each other in this simple image. The bright summer flowers of crocosmia are a treasure in any garden. 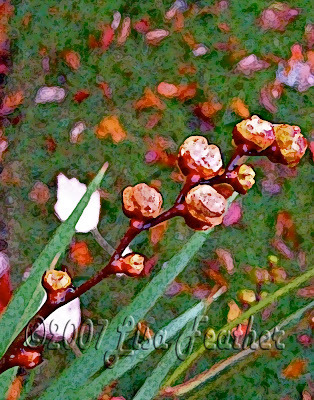 Yet while this plant is treasured for its flowers, the flowers eventually yield their bright color to the formation of beautifully textured seeds as summer turns to fall. These seeds, framed against a fall lawn strewn with purple, orange and gold, caught my eye as I looked just past my back deck one autumn day. The sword shaped foliage seemed to punctuate the autumn landscape and add interest and contrast to the oddly beautiful seedhead. I grabbed my camera and tried to capture the moment. In this image I enhanced the beautiful colors and the wonderful textures of this autumn landscape that happened to be just beyond my own backdoor. This image was captured on the south jetty at Fort Stevens State Park on the Oregon coast. From my rocky perch I sat with my camera and watched the water pound the rocks under a dreary sky. The gray light brought out the colors and shading of the rocks along the jetty. It also highlighted the white foam on the waves. In this image I tried to bring out the subtle qualities of the light in the Pacific Northwest. As I study the picture now I think it might better be titled "100 Shades of Gray". 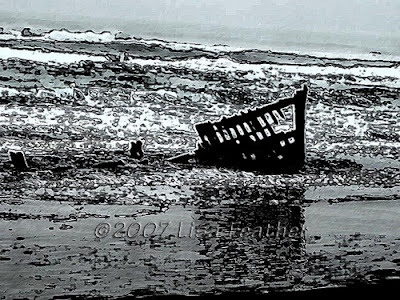 The shipwreck at Peter Iredale beach is an easily identifiable feature of the Oregon, Coast. Its remains rest on the sand in Fort Stevens State Park near Astoria, Oregon. 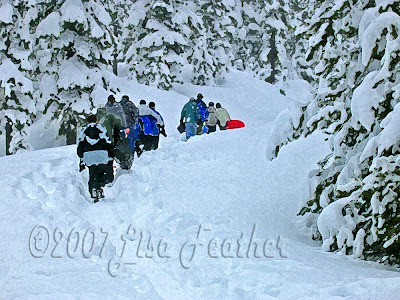 This image was taken in March of 2007. Despite the dreary sky the form of this well known shipwreck is brightly mirrored in the relentless waves that lap the surrounding sand and slowly claim the wreckage for its own. 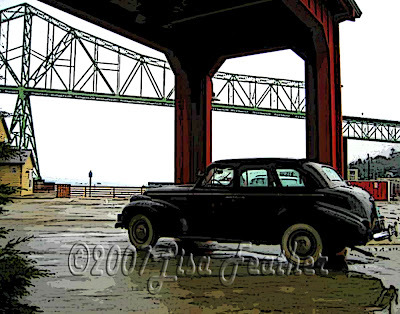 This image was captured outside the Cannery Pier Hotel in Astoria, Oregon. Only after I had taken the photo did I notice the alignment of the hotel's 1939 Buick and the arch in the portico as well as the Astoria-Megler Bridge and the angle of the hotel's overhang. I was also struck by the color gleaming in the gray afternoon and the faint reflections on the damp pavement. The repeating lines and shadows, the way man wrestles with nature and nature echoes back our efforts can be seen again and again in the details here. This image was captured from the bailey of Himeji Castle in the Spring of 2007. 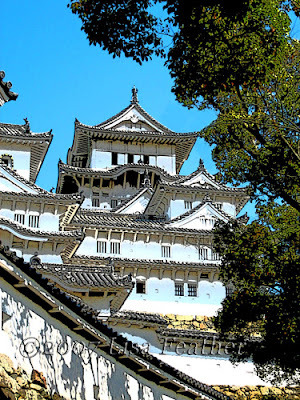 It offers a splendid view, looking up at the Main Tower, or donjon, of the "white egret castle" and to the bright blue sky beyond. It also captures graceful shadows dancing in the breeze on the castle walls below. This image of Mt. Adams was captured from the top of Mt. 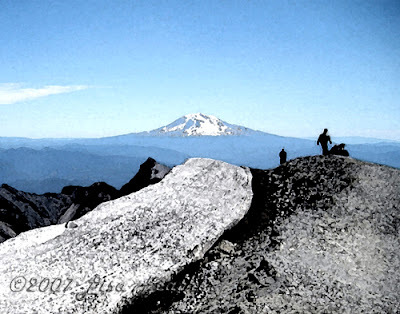 St. Helens in July of 2007. It shows the upper edge of the volcanic ridge and the volcanic pumice that covers the mountain top. It also shows the silhouette of several hikers at the edge of the ridge reveling in the view. This image of a spiral staircase was taken at Melk Abbey in Austria. The staircase can be found just beyond the elaborate and impressive library. It is beautiful whether looking up or down. 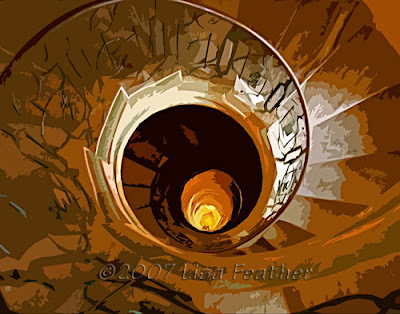 This image captures the steps descending the staircase and revolves around an echo of the resolution and light to be found at the end of the spiral. This image, looking up through the knotted branches of a disfigured tree, was taken along the Cape Horn Loop Trail in the Columbia River Gorge. The foliage that adorns its base is ragged and sparse. Dry lifeless twigs are interspersed with more verdant leaves, clinging to life. 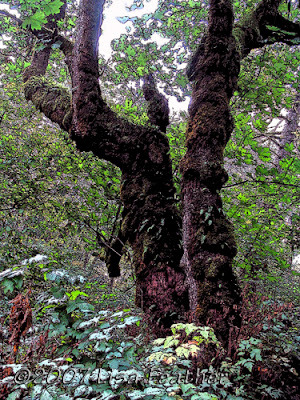 Moss hangs thickly tugging at the branches and fungus saps its massive trunk. Still the tree persists. 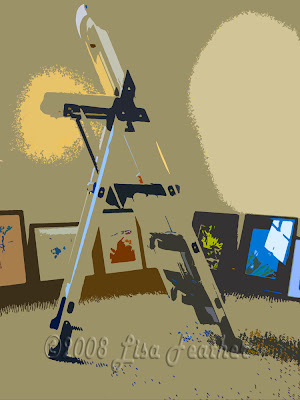 It stands upright and suggests the form of arms reaching for the sky, determined to grasp the light and persevere.